Remember when you were a kid and you were so excited for the Holidays and getting to run around and play with your cousins? You were so amped up for that meanwhile your mom was running around the place like a crazy woman yelling at everyone to help her clean and stay out of the kitchen while she prepares the food. Fast forward to now, are you that parent? Are you that host? Do you love hosting the holidays in your home until the few days before when you realize you need to get your home in order and go to the grocery store? It's okay, because I used to be that person. 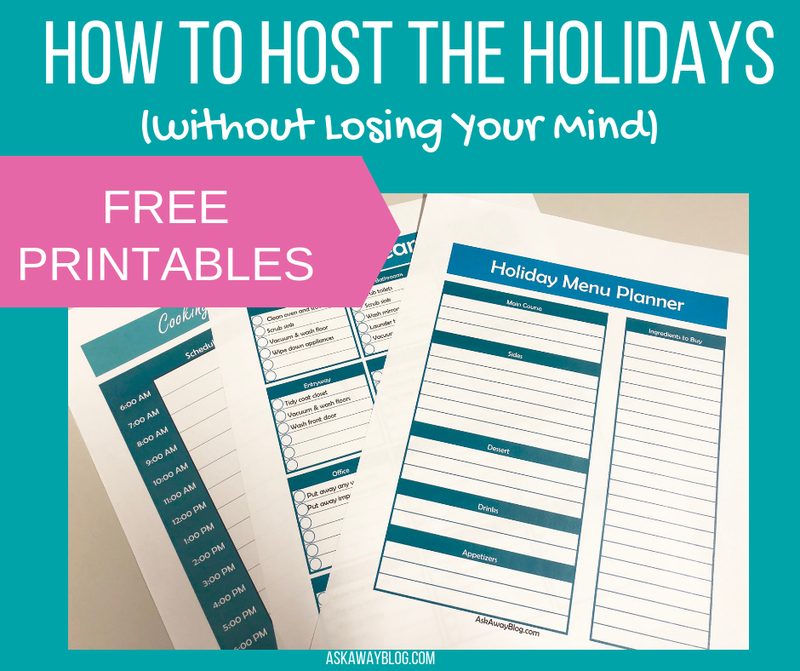 And today, I'm going to show you how you can host the holidays and stay completely sane! Look, I get it, life's busy and when you throw in the holidays it gets even more chaotic and there's even more pressure on you. So here are some tips to keep everything enjoyable and flowing smoothly before, during, and after you host the holidays in your home this year. Planning your meal in advance is one of the best things you can do to prepare. I always do mine about 3 weeks before the actual day. 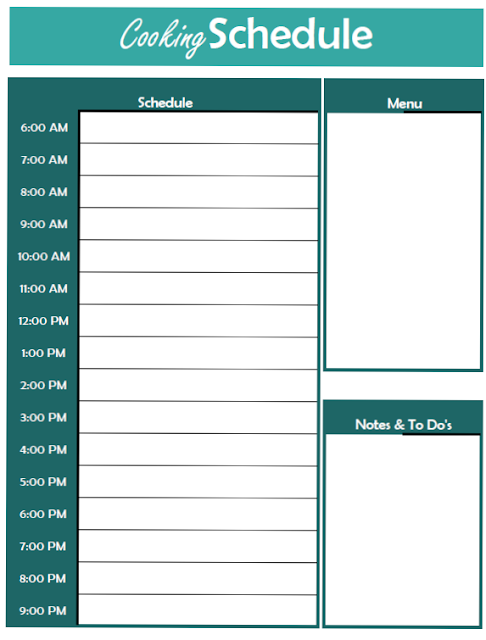 Planning the meal out not only helps you figure out what you need and how to set up your cooking schedule the day of, but it also helps you figure out what each of your guests can bring. Some people want to cook everything themselves, and that's fine, you little control freak you, but if people are volunteering to bring a side, let them! It's less clean up for you and less prep for you! Plus people feel good sharing food so don't take that from them. 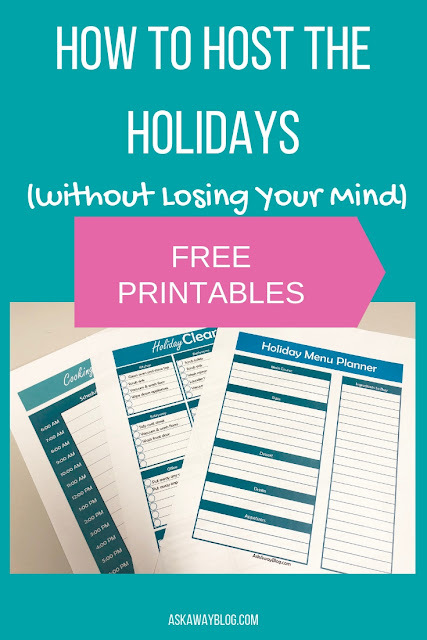 You can get my FREE Printable Holiday Meal Planner to plan out what will be served and make notes on who can bring which item. 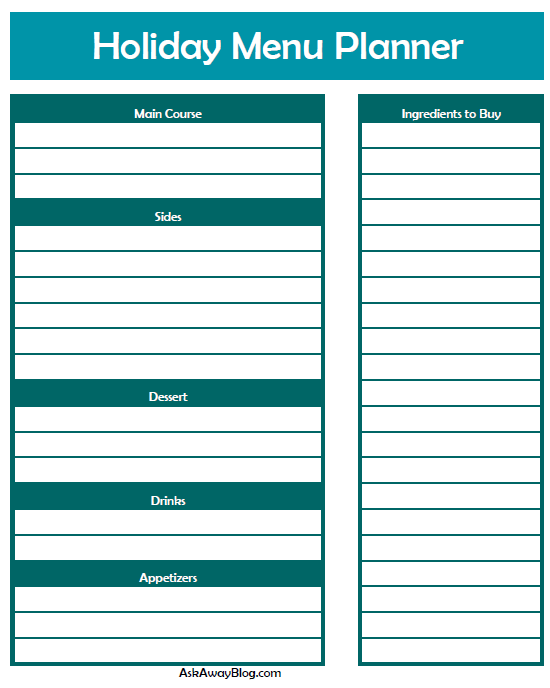 You can use the meal planner you made to determine what ingredients you have already and which ones you need to buy at the grocery store. When I do this, I gather all my recipes, read over the ingredients, and check stock in my pantries as I go. Then whatever I don't have I add to my grocery list. I usually do this 2 weeks before the holiday so that if I forget something I have another week to run out and get it. Waiting till the day before for ingredients besides the turkey or ham can lead to forgotten items and emergency trips to the convenience store the next morning praying they have what you need! In a perfect world we could clean our homes a week before a holiday and it would stay neat and tidy. But this ain't a perfect world so in reality, you need to clean your home a day or two in advance. Do not wait to clean until just hours before your guests arrive because it will lead to chaos and your focus needs to be on cooking your meal! 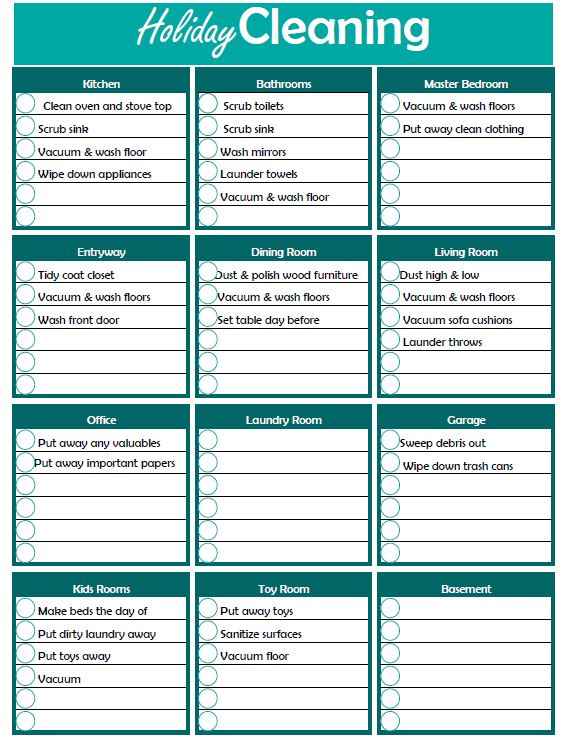 Use this FREE Printable Holiday Cleaning List to go through your home room by room and get it neat and tidy. The key is to find cleaning tasks you can do a week in advance, like decluttering and dusting so that on the night before or morning of, all you have to do is vacuum, wash the floor, and wipe down counters. 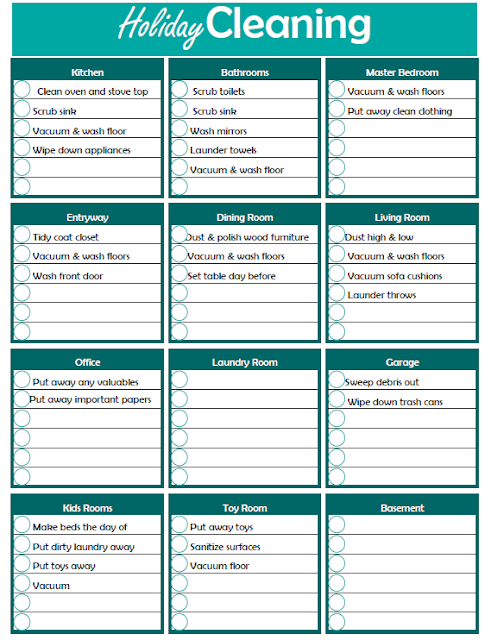 Get the windows washed ahead of time and do any guest bedroom laundry if you have family staying the night. If you have kids, enlist their help in cleaning. There's no reason you should do it all yourself. A cooking schedule is the absolute key to keeping your holiday going smooth. It allows you to determine what time certain things need done so you aren't rushing around in a panic, trying to do multiple things at once. I honestly don't know how anyone survives without doing this. I always remember my mom having a written cooking schedule at the holidays and I'd see her cross thins off as she went along. Use this FREE Printable Holiday Cooking Schedule to streamline your day in the kitchen. Start by working backwards from the time you want to begin eating your meal. 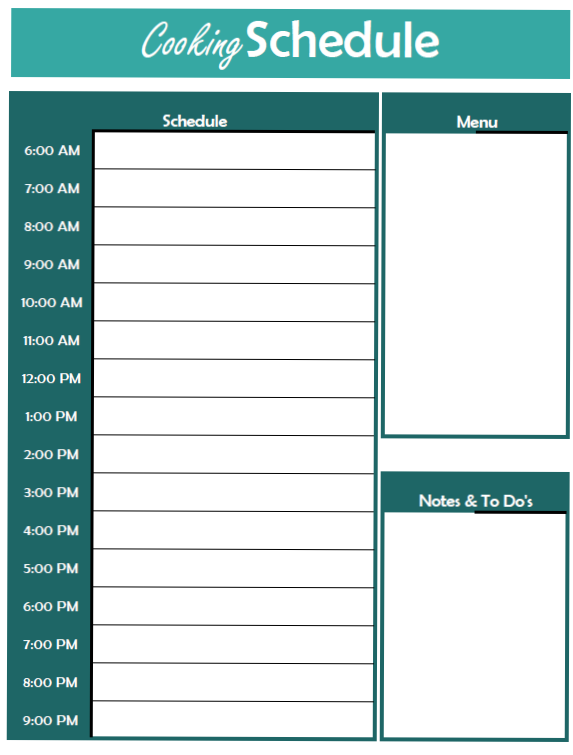 Then you take all of your recipes and go through each one and work backwards by adding it to your schedule. As you do this with each recipe, you'll notice there are certain things that need to be done at the same time, but that's okay because you know this in advance. So if the time comes and you can't multi-task you can already plan out having someone else in the kitchen with you to help. Cross each task off as you do it, and you'll feel like a boss by the time your meal is served! So, with a little planning and preparation ahead of time, you can have a smooth flowing schedule on the day of your celebration and still be able to enjoy the time with your loved ones! What's your most challenging task when it comes to hosting the holidays? 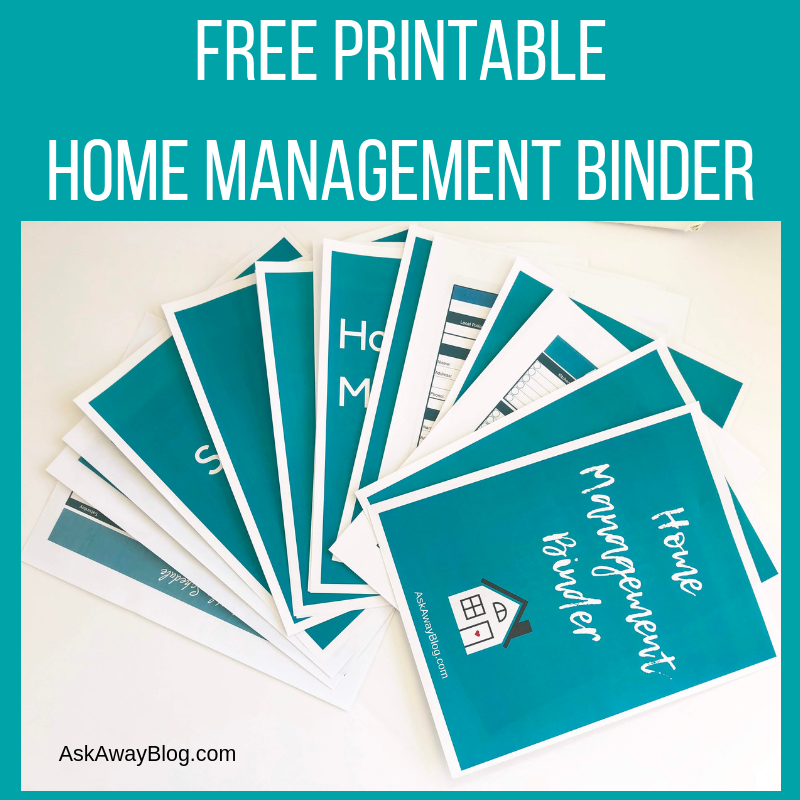 PS - If you liked the FREE Printable Holiday Worksheets, you'll love my FREE Printable Home Management Binder. Make sure you sign up to receive it! Thanks for sharing these printables. I will so be using them. Since my inlaws are coming for Christmas.